Topics: Robot control techniques (adaptive, robust, learning) Modeling and identification Control of discrete / continuous-time robotic systems Non-holonomic robotic systems Intelligent control Control based on sensing Control design and architectures Force and compliance control Grasp control Flexible robots Micro robots Mobile robots Walking robots Humanoid robots Teleoperation and man / machine dynamic systems Multi-Robot-Systems, cooperative robots Applications: space, underwater, civil engineering, surgery, entertainment, mining, etc. 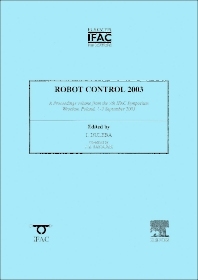 Provides the latest research on Robotics Contains contributions written by experts in the field. *Part of the IFAC Proceedings Series which provides a comprehensive overview of the major topics in control engineering.